Here, though, we’re using dried fava beans instead of fresh. The flavor is similar to that of chickpeas – a little nutty, but very mild – and the texture is close to that of other beans. When using dried fava beans, you can certainly go though the process of peeling them, but we find that a long soak and proper cooking time (usually 1-2 hrs at a simmer) leaves you with beans tender enough to eat with the peels on. Now, maybe not if you’re eating them by themselves – but for this application, or any other where you’re mixing/pulsing/chopping them into a coarse mixture, leaving the peels on is just fine (and an amazing timesaver!). Fava beans are, just as all their legume family members, high in many nutrients. Among those that stand out, we find folic acid, iron, potassium, magnesium… and protein, of course. And slow carbohydrates. All in all, a nutritional profile that deserves a lot of respect. 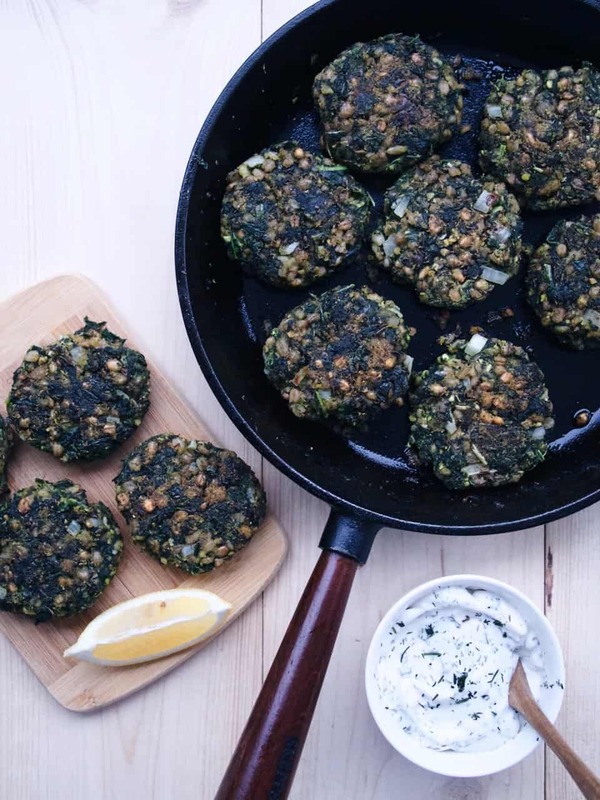 When paired with a generous amount of green kale and wheat berries, it gets even better. Each little patty is quite the plant-based rocket fuel, if you think about it. We like to serve them as is, with just a lemon wedge and/or a yogurt-type of dipping sauce (or mustard – my personal favorite! ), in a bowl with roasted vegetables or a hearty salad, or stuffed in a pita bread or flatbread, similar to how you would eat falafel. No matter what though, they’re delicious and great to have around. Therefore, go ahead and make the whole recipe! I know the amounts might seem a little daunting, but when you have 30-ish patties for upcoming lunch boxes, dinners AND to pop in the freezer for another time… you’ll be pleased. Promise. It’s explained in the instructions below as well, but I just want to emphasize the part where you go in with your hands and sort of “squeeze” the batter together. You’ll understand what I’m talking about once you’re there, but in order for the patties to hold together, really massaging the ingredients is crucial. It’ll take just a minute or two, but will be well worth the effort. As far as the kale, we’re using our own from the freezer. Know that any kale bought frozen from the store has been blanched prior, so either go for that (by far the easiest option) or buy fresh and blanch yourself (this will be a bit of a hassle, since you’ll need about 1 1/2-2 kg worth of fresh kale to get the amount needed for the recipe). That’s all – good luck! Bring 3 1/2 dl water and 1/4 tsp salt to a boil, add in wheat berries and allow to simmer for 10 min. Set aside. In the meantime, place fava beans in a food processor and pulse until you have a coarse mixture (crumbly consistency, no paste). Place contents in a large bowl. Squeeze out all excess liquid from the kale, coarsely chop and add to the bowl. Stir in onions and garlic, and then blitz the mixture a few times (and only a few times) using a hand mixer. Add in wheat berries and the rest of the remaining ingredients, except for the frying oil. Stir it all together, and then, with your hands, massage and squeeze the mixture as if working a dough. Work all ingredients together for about a minute or so, or until you feel like you can easily form patties (that will stick together). Form patties, place on a flat surface such as a plate or cutting board, and refrigerate them for about 20 min. After that, heat up olive oil in a skillet over medium heat and fry them for about 5 min on each side. Serve warm, or refrigerate for later. Koka upp 3 1/2 dl vatten och 1/4 tsk salt, tillsätt matvetet och låt sjuda i ca 10 min. Sätt sedan åt sidan. Under tiden, lägg bönorna i en matberedare och kör tills du har en grov, smulig konsistens. Placera dem sedan i en stor skål. Krama ur så mycket vätska du kan från grönkålen, och hacka den sedan grovt. Tillsätt till skålen, och rör därefter ner lök och vitlök. Mixa sedan blandningen ett par gånger (och enbart ett par gånger) med en stavmixer. Tillsätt matvetet och resterande ingredienser, förutom oljan till stekning. Rör samman, och massera/krama sedan blandningen med dina händer, som om du arbetade en deg. Arbeta samman alla ingredienser ordentligt i någon minut, eller tills dess att du enkelt kan forma biffar som håller ihop. Forma biffar, lägg dem på ett fat eller en skärbräda och ställ dem i kylen i ca 20 min. Därefter, hetta upp olja i en stekpanna på medelvärme, och stek biffarna i ca 5 min på vardera sida. Servera varma, eller förvara i kylen till senare.